Being diagnosed with cancer is a life changing event. According to the National Cancer Registry Ireland, there are 112 people diagnosed with cancer daily and the disease causes 8,875 deaths each year. But as survival rates improve, there are more than 170,000 people living with and beyond cancer. One of the most anxious areas for cancer survivors is the transition back to work. 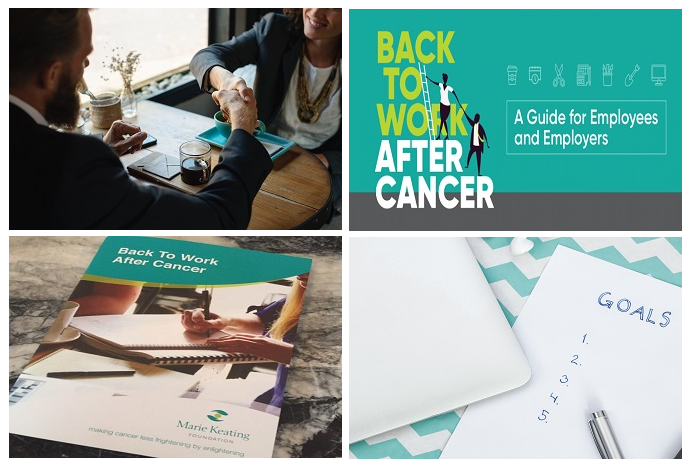 The Marie Keating Foundation has recently launched a ‘Back to Work After Cancer’ booklet and training seminar in response to the need for support and comprehensive information for employers and employees (27th February 2019). The publication was supported by Novartis and Chambers Ireland. It details advice and tips for survivors on how to plan their return to work and how to speak to their employer about the kind of supports they may need during this time. It also provides information for employers on what to consider and how best to support an employee retuning to the workforce after or during a cancer journey. The guide advises on how to make a return to work plan and how to manage the process when someone has returned. It also addresses employer concerns and details the role the employer should take when someone is off sick and when they return to work. To watch Back To Work After Cancer Guideline for Employees video please click here. To view more detailed Back To Work After Cancer - A Guide for Employees and Employers in full, please click here. To download the Back To Work After Cancer - A Guide for Employees and Employers booklet in pdf, please click here. Alternatively, if you need further information or advice in relation to accommodating an employee’s disability and how to manage it, please do not hesitate to contact one of our team on (01) 415 12 85 or e-mail [email protected].